I’m a Yoga Educator and Registered Nurse and who empowers people to live vibrant, authentic, meaningful lives. I believe we all have unique destiny, and purpose in life. Our work is to discover our destiny and build our capacity to live it fully, with grit and grace. I can help you upgrade your personal inner operating systems to build resilience and uncover innate your wisdom, upgrading how you live, love and lead. 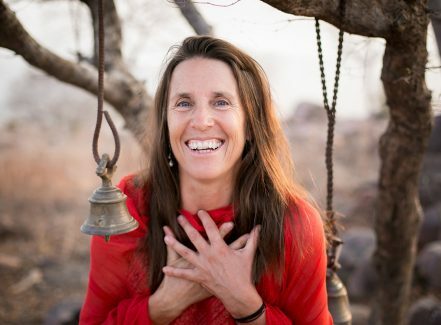 Uniquely qualified through my years teaching and practicing Nursing, Yoga, Ayurveda and evolutionary coaching, I bring a lifetime of adventurous seeking, deep experience, motherhood, grand motherhood and the gifts of my world-class teachers to you. I’m an R.N. of 39 years, Certified Level 2 Para Yoga teacher, E-RYT-500, Ayurvedic Yoga Specialist, and a former National Outdoor Leadership School and Outward Bound Instructor. With an extensive experience and training in healthcare and personal transformation, I’m at my best when working with clients to clarify and live their soul’s purpose. I’m the founder of Yoga Beyond the Poses , offering online and live mentoring to empower you to thrive at all stages of life. The mother of three powerful children and grandmother of three little ones, I live in the mountains of Colorado with my spoiled cats, several pairs of skis, a mountain bike and endless gratitude. Mother Nature, family, friends and community nourish and sustain me in my service to you.